07:29 AM April 12, 2008 Just made the train at Stamford CT on my way into l:NYC: for BarCampMoneyNYC. Will take lotsa pix. 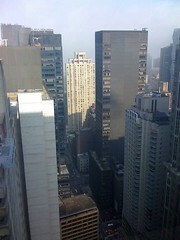 08:42 AM Did I mention BCMNYC is being held on top of the world? Pix going to my fb page. 09:29 AM FreshmanFund.com is going to help parents and friends put money into 529 plans for college. 10:14 AM In on session about FiLife a new community with info about personal finance. Joint venture between IAC and Dow jones. Launches soon. 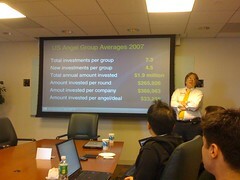 10:41 AM David Rose explains Angel Groups fit between individual Angels and large VCs. 10:49 AM AngelSoft rocks for both angels and entrepreneurs. 11:45 AM Mike Solomon sharing his experience outsourcing programming overseas, esp. India. 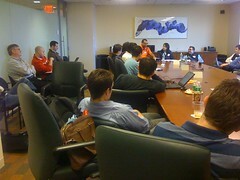 11:47 AM discussion is Ultra Light biz startups ala Digg and Truemors. 01:22 PM discussion is early stage investing in start ups. Moderated by Lili Balfour. Hank Williams and Jay Levy also featured. 02:33 PM Early stage biz investor Jay Levy says now is a great time to start/build a company. 02:55 PM Hank Williams is leading a session on the problem with Chris Anderson’s the Free Economy. What do you replace the revenue with? 03:05 PM it’ll never get old when two helicopters fly by at eye level. 03:08 PM Hank Williams just said “freetards” and the whole room laughed. 03:10 PM @guykawasaki Truemors was cited as an example of an Ultralight startup at a session during BarCampMoneyNYC today. 03:23 PM room getting rowdy and fiesty debating the economics of Free. Awesomeness. Hank Williams is a good agitator. 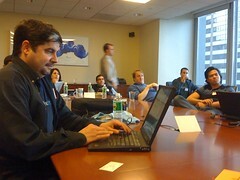 Huge props to Jonah Keegan for spearheading a very, very successful inaugural BarCampMoneyNYC. Turnout was in the neighborhood of 50 people, which should be considered fantastic.